We're usually forced to live with our mistakes in this world, but WhatsApp is now giving us a way to erase our little embarrassments. Starting now (at least for some users), if you accidentally send a message to someone, you'll be able to delete it for everyone who can read it as long as you act within seven minutes. WhatsApp describes the process more thoroughly in an updated FAQ entry. WhatsApp already gave the illusion of allowing this, but the truth was that only you would see the message deleted from your client. Whoever else you sent the message to would continue seeing it until they deleted it themselves, which could be a problem if you sent the message to the wrong person or it contains a mistake. The feature is clearly labeled, too, so you'll now see an option called 'Delete for everyone' when you select the trashcan option after tapping and holding on a message. If someone on the other end tries to read the message in the future they'll get a notification saying 'This message was deleted'. Again, though, you'll have to act within seven minutes of sending the message for it to work. You may have to wait a while to enjoy the full benefits of the new feature. For one, it's a gradual rollout, so not every user has it yet. 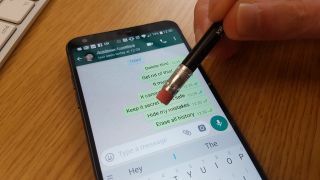 Secondly, both users will need to have the latest version of WhatsApp running for it to work properly, otherwise you may hit 'Delete for everyone' and sadly find that everyone but you can still see the message – WhatsApp won't send you a notification if this turns out to be the case. And then, of course, there's always the chance that the recipient will see your message anyway, allowing them to screenshot your 'mistakes' for everyone to see. In other words, we're glad the feature has made it to WhatsApp, but you might still want to play it safe and just be more aware of what you're sharing when you send a message.